To accommodate football, soccer, cross-country, baseball, softball and field hockey, plus a spectator amphitheater lawn overlooking the playing fields. 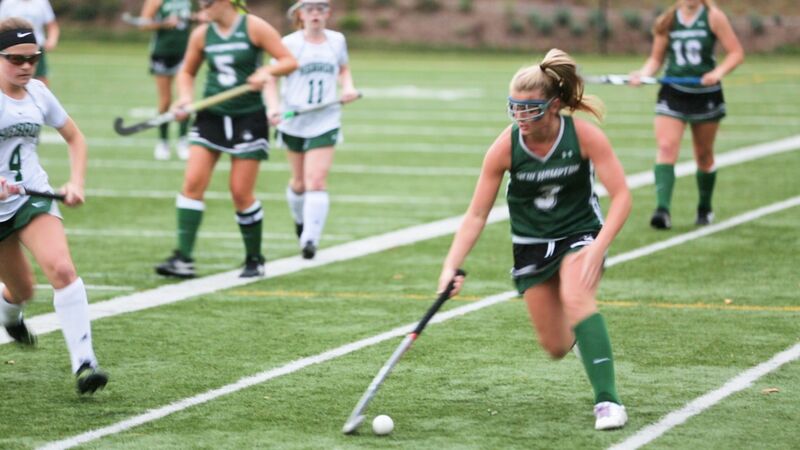 Our marquee synthetic turf Kennedy Field is our showcase for fall and spring sports. Nine modern tennis courts offer ample space for singles or doubles play. Ten miles of cross country trails begin near our athletic fields. Use of White Mountain Country Club for instructional and competitive golf. The best outdoor climbing environment in New England is just 25 minutes from campus in Rumney. Dedicated trails expressly for New Hampton School ski and snowboard training at Loon Mountain Resort and Ragged Mountain. Burleigh, our own 250 acre mountain, is just a mile from campus and offers an excellent environment for camping, hiking, and team building exercises. Just a 15 minute ride from campus is our equestrian facility which includes stables, and indoor and outdoor riding rings used for instructional riding as well as preparation for dressage competitions. The Athletic Training Room is located on the first floor of the Smith Gymnasium in the Arts and Athletic Building. An athletic trainer is on duty for all home games. Visiting teams are expected to supply their own cups/water bottles and towels. Water will be provided. Team rooms and shower facilities are available. Please provide your own supplies. If any special services are needed please call ahead. AED is available at all games. An orthopedic physician is present at all home varsity football games.